Being a homeowner in Brazil is hard work. Although mortgage interest rates have been slowly coming down since last July — when the average rate peaked at 11.3 per cent, according to the Bank of Brazil — rates are still high. In August this year, the average rate was about 8 per cent, with deposits of 20 per cent usually being required to secure the purchase. The country’s economy is struggling to emerge from two years of recession and a contraction of nearly 8 per cent. Despite five successive quarters of growth, the recovery remains anaemic — latest figures for the second quarter show only a 0.2 per cent gain. Brazil’s consumer credit rates — which are among the highest in the world, according to Marcos Casaran, head of Latin America for Oxford Economics in Mexico — are helping to depress consumer confidence. With central bank interest rates at 6.5 per cent in August, the average borrowing rate on household debt was 30 per cent, according to the Central Bank of Brazil. The result has been a drop in housing demand, especially from rich buyers pulling back from discretionary second home purchases, says Andreas Hahn of Real Estate Brazil, an agent in São Paulo. In the past five years, house prices have gained just 1.7 per cent, according to Oxford Economics. Taking into account Brazil’s inflation over the period, the real price change is a fall of 15.3 per cent. Map of Brazil Brazilian homeowners are hoping a new president — whom Brazilians will select from two candidates on October 28 — will help turn this around. If the winner can deliver much-needed political and economic stability, it is hoped that banks will again embrace consumer credit — including offering more competitive mortgage deals. “According to this argument, credit will then start flowing again, bringing Brazilian buyers back to the real estate market,” says Casaran. “Nearly all my high net worth investors are sitting on the fence until the elections are complete and we have a definite outcome. This year has been a bit of a write-off for luxury home buyers but I expect the market to pick up once Bolsonaro is elected,” says Mike Smith who runs local agent Brazil Beach House in Natal. The bookies’ favourite is far-right candidate Jair Bolsonaro, who won 46 per cent of the vote in the first round of the presidential election on October 7, ahead of Fernando Haddad, from the leftwing Workers’ party. Haddad, who won nearly 29 per cent of the vote and who will face Bolsonaro in the run-off on October 28, replaced former president Luiz Inácio da Silva as his party’s candidate when Brazil’s electoral court ruled that da Silva could not run for the presidency from jail, where he is serving a sentence for corruption. Bolsonaro has long expressed offensive views on women, the LGBTQ community (he once said he would rather have a son die than be gay), as well as frequent racism against Brazil’s black and mixed-race communities. However, he is favoured by investors, who believe that his proposals to privatise state-run enterprises and increase the independence of Brazil’s central bank will provide the country with much-needed economic stability. The problem with the wait-and-see strategy for overseas homebuyers is that they risk missing out on bargain prices. A combination of Brazil’s uncertain economy and the corruption scandal that has engulfed many of the country’s senior politicians — including former president Dilma Rousseff, who was impeached in 2016 — has taken its toll on Brazil’s currency. The Brazilian real fell 29 per cent against the dollar in the 12 months to the middle of September. For bold foreign buyers, this has created huge discounts, which will narrow if Brazil’s economic recovery firms up and the real strengthens. Hahn says a higher number of his foreign clients have bought homes this year, taking advantage of the savings provided by Brazil’s weakening currency. “This year, the number of sales to this group increased by half on the same period in 2017,” he says, adding that buyers from abroad now make up two out of three sales. Most of Hahn’s clients are Swiss, French or German; many have established businesses in Brazil in the last year — typically in agriculture or tourism — betting on the country’s recovery. Much of the overseas money is invested in coastal villas or in prime properties in Rio de Janeiro and São Paulo. In the Jardins area of São Paulo — a district popular with international buyers and Brazil’s business elite — Christie’s International Real Estate is selling a three-bedroom apartment for R$4.9m ($1.35m). In Bertioga, a seaside town in the wider São Paulo state, Sotheby’s International Realty is selling a six-bedroom penthouse for R$18m. Outside Brazil’s major cities, Hahn points to the island city of Florianópolis — the capital of Santa Catarina, a state in Brazil’s south — and its surrounding neighbourhoods. For those attracted to the city buzz, apartments in the southerly neighbourhood of Abraão, just over the bridge on the mainland, are popular. Hahn says that the current fashion is for landscaped apartment complexes, which include gardens and swimming pools. In the nearby central district of Florianopolis, local agent Daniel Ferreira is selling a four-bedroom penthouse with a sea view for R$2.15m. When it comes to holiday homes, much of the hottest property is in the beachside neighbourhood of Jurerê Internacional, roughly 20 minutes’ drive from the city on the north of the island. Here minted expats as well as the great and good from Brazil stretch out in top-end villas — often in gated communities — as well as apartments near the beach. Nightly Ibiza-style DJ bars blend the creature comforts of the champagne set with Brazil’s carnival tradition. 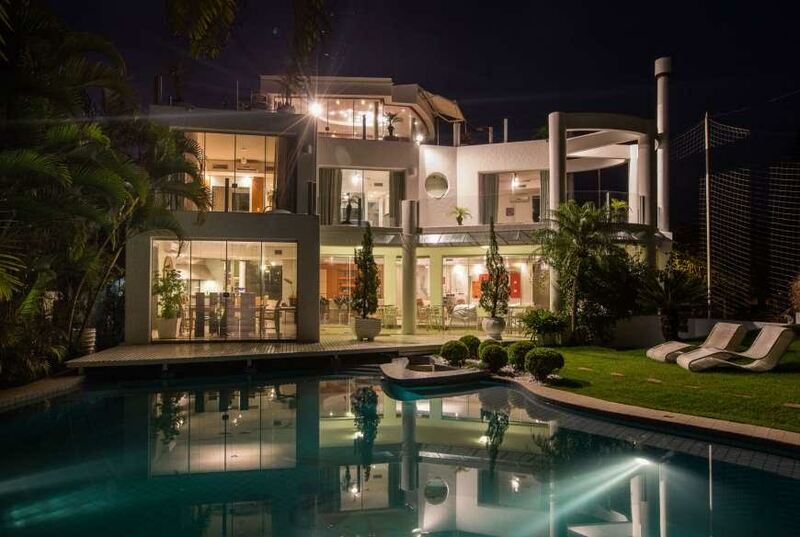 Imoveis de Luxo & Cia is selling a five-bedroom villa in Jurerê Internacional for R$9m. Brazil Beach House is selling a five-bedroom house with a pool in the same neighbourhood for R$7.8m. Well-heeled Europeans are not the only ones believing in a Brazilian housing market recovery. Casaran says that several US private equity funds have invested in commercial and residential property over the past year, betting that Brazil’s recovering economy and a favourable election outcome will see lower mortgage rates kick-start domestic demand. Both groups of buyers are taking a punt that the new president can keep the faltering economic recovery on track. That is a big gamble. US interest rate rises and Donald Trump’s trade wars have caused chaos in emerging markets this year. In the four weeks to June 18, Brazil’s flagship Bovespa equity index lost nearly a fifth of its value (it has since recovered some of the losses).